Create a delicious Rock Candy ensemble with top-drilled bicone CRYSTALLIZEDTM- Swarovski Elements and an Alacarte Teardrop clasp. Different patterns and dimensions are formed by mixing colors as well as sizes using the top-drilled bicones in 6mm, 8mm or a combination of both. Each bracelet color comes with it's own instructions and pattern so that you can replicate the exact combination if desired. 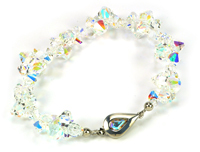 BRACELET EXTRA'S: Our kit includes extra crystals for those 'over-tension' mishaps or to cover one that may be broken (we do check but sometimes one slips by). These extra crystals, if used, would allow you to make the bracelet 8" to 8 1/2". 2-PAIR EARRING BONUS: Kit includes both nickel-free crystal earwires and earring post cups, extra bicones and headpins so that you can make two shorter pairs, or a longer pair and separate earring posts. Earrings use 6mm top-drilled bicones to match the bracelet. Tools: You'll need: 2-part all purpose clear-drying epoxy, crimping pliers, chainnose and roundnose pliers (or 2 pairs of chainnose pliers), wire cutters. Kit includes both crystal earwires and crystal post tops. Teardrop Clasp can be purchased set with the crystal. 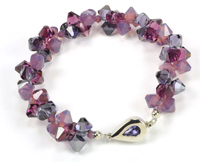 Note: Clasps are not returnable as crystals are custom set for each order. If you are buying a kit above, your clasp is already included. Select finish & crystal color to purchase finished clasp. Nickel-free Teardrop Earrings can be purchased set with the crystals. Note: Earrings are not returnable. Select finish & crystal color to purchase finished Earrings.